Harbor Vintage Motor Co., Inc. Reviews and Comments for Harbor Vintage Motor Co.
Sells small engine parts for all makes and models, including lawn mower blades, chain saw chains, go-kart parts, tiller parts, and golf cart parts. Parts and accessories for Harley-Davidson motorcycles. Restoration, performance, replacement, custom and chrome add on parts from all of the major manufactures are available, as well as installation and repairs. Located in Pittsburgh, Pa, but will ship parts worldwide. Genuine replacement, plumbing parts, kitchen and shower faucet parts and toilet parts. Online parts catalog & order system for Infiniti parts & accessories. Parts for the Jeep CJ, Wrangler and Cherokee. Search by key word, vendor, or group to locate parts. Jaguar and Land Rover parts specialist. Genuine OEM and brand name aftermarket parts. Products ranging from KTM OEM Parts, K-Style, Power Parts, after market accessories, and riding apparel. Domestic and imports, late model parts and rebuildable autos. Online database for parts search. European car parts supplier, with a range of Saab parts, mainly for 900s and 9000s. List of parts and prices. Recycled foreign and domestic parts for cars, trucks, and mini vans. Online database for parts search. Online retailer of Tecumseh, Briggs and Stratton, Kohler engine parts as well as other Go-Kart parts. Suppliers of parts for Chevrolet and GMC trucks. From 1936-1972 and a growing number of parts for 1973-1987. Used and foreign parts. Online database for parts search. All General Motors Parts. Online parts quote and order form. Used car and truck parts with online database for parts search. Providing new and used parts for Harley and foreign street bikes. Dismantler with quality used parts at low prices. We also have a large inventory of antique parts. Specializes in hard to find used sterndrive and outboard parts. Also sells service manuals. Call or e-mail to locate specific parts. Offers NOS Mopar parts, and GM parts listed by year and model or part number. Includes business profile and online parts query. Ring and pinion gears, axles, axleshafts, transmissions, performance, polyurethane suspension and undercar parts. Online catalog and parts database. Sells dune buggy frames, performance parts, engine parts, gas tanks, shocks and struts, automotive gauges for all cars, and restoration parts for Volkswagens. Other accessories as well. New and used drag racing parts. Buy, sell and trade performance parts. Slicks tires, carborators, engines, bodies, heads are some of the parts for sale. New and used parts and accessories, stock through high-performance. Engine and trans. building, parts, and services. Turbos. Fuel injections. Offroad buggy frames, chassis, parts, supplies. Retailer and wholesaler of rifle parts and accessories. Specializing in .45 auto pistols, military style rifles. Offers magazines, replacement parts, and bipods. Parts and accessories for Volkswagen and Audi. Also carries a few BMW parts. Fiat parts source with an illustrated parts guide for the Fiat 124 Spider/Spyder, Fiat Spider 2000 and Pininfarina Spider. Also have parts available for other US specification Fiats, Lancias and Bertone X1/9s. Sells new and used, early and late model Mustang parts. Posts parts, specials, directions and contact information. If the business hours of Harbor Vintage Motor Co., Inc. in may vary on holidays like Valentine’s Day, Washington’s Birthday, St. Patrick’s Day, Easter, Easter eve and Mother’s day. We display standard opening hours and price ranges in our profile site. We recommend to check out harborvintage.com for further information. 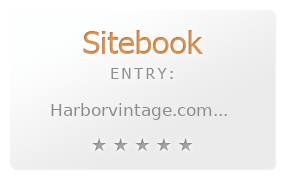 You can also search for Alternatives for harborvintage.com on our Review Site Sitebook.org All trademarks are the property of their respective owners. If we should delete this entry, please send us a short E-Mail.